The main goal objective of this report is to analysis Customer services of Prime Bank Limited. General objectives of this reports are to carry on, transact, undertake and conduct the business of banking in all branches, to receive, borrow or to raise money on deposit and loan or otherwise upon such terms as the company may approve. Here also analyze the business of discounting and dealing in exchange of specie and securities and all kinds of mercantile banking and to provide for safe-deposit vaults and the safe custody of valuables of all kinds. Finally this report make swot analysis Customer services of Prime Bank Limited. Modern banking system plays a vital role for a nation’s economic development. Over the last few years the banking world has been undergoing a lot of changes due to deregulation, technological innovations, globalization etc. These changes in the banking system also brought revolutionary changes in a country’s economy. In the backdrop of economic liberalization and financial sector reforms, a group of highly successful local entrepreneurs conceived an idea of floating a commercial bank with different outlook. For them, it was competence, excellence and consistent delivery of reliable service with superior value products. 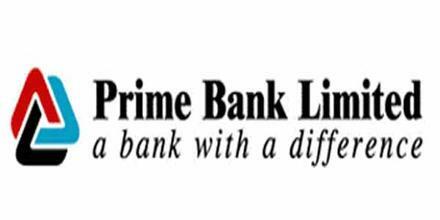 Accordingly, Prime Bank Ltd. was created and commencement of business started on 17th April 1995. The sponsors are reputed personalities in the field of trade and commerce and their stake ranges from shipping to textile and finance to energy etc. As a fully licensed commercial bank, Prime Bank Ltd. is being managed by a highly professional and dedicated team with long experience in banking. Prime Bank Ltd. has already made significant progress within a very short period of its existence. The bank has been graded as a top class bank in the country through internationally accepted CAMEL rating. The bank has already occupied an enviable position among its competitors after achieving success in all areas of business operation. Prime Bank Ltd. offers all kinds of Commercial Corporate and Personal Banking services covering all segments of society within the framework of Banking Company Act and rules and regulations laid down by our central bank. Diversification of products and services include Corporate Banking, Retail Banking and Consumer Banking right from industry to agriculture, and real state to software. The bank has consistently turned over good returns on Assets and Capital. During the year 2005, the bank has posted an operating profit of Tk. 1520.34 million. The bank’s current capital adequacy ratio of 9.96% is in the market. In spite of complex business environment and default culture, quantum of classified loan in the bank is very insignificant and stood at less than .96%. Prime Bank Ltd.
Bangladeshi Banks who have become member of SWIFT (Society for Worldwide Inter-bank Financial Telecommunication) in 1999. SWIFT is members owned co-operative, which provides a fast and accurate communication network for financial transactions such as Letters of Credit, Fund transfer etc. By becoming a member of SWIFT, the bank has opened up possibilities for uninterrupted connectivity with over 5,700 user institutions in 150 countries around the world. To carry on, transact, undertake and conduct the business of banking in all branches. To receive, borrow or to raise money on deposit, loan or otherwise upon such terms as the company may approve. To carry on the business of discounting and dealing in exchange of specie and securities and all kinds of mercantile banking. To provide for safe-deposit vaults and the safe custody of valuables of all kinds. To carry on business as financiers, promoters, capitalists, financial and monitory agents, concessionaires and brokers. To act as agents for sale and purchase of any stock, shares or securities or for any other momentary or mercantile transaction. To establish and open offices and branches to carry on all or any of the business abroad and within the country provided prior permission is obtained from Bangladesh bank. A bank is a financial institution whose primary activity is to act as a payment agent for customers and to borrow and lend money. It is an institution for receiving, keeping, and lending money. The first modern bank was founded in Italy in Genoa in 1406,  its name was Banco di San Giorgio (Bank of St. George). Modern banking system plays a vital role for a nation’s economic development. Over the last few years the banking world has been undergoing a lot of changes due to deregulation, technological innovations, globalization etc. These changes in the banking system also brought revolutionary changes in a country’s economy. Present world is changing rapidly to face the challenge of competitive free market economy. Banking Sector in Bangladesh is facing challenges from different angles though its prospect is bright in the future. In general banking activities Customer service is the most important part. In this respect bank management needs to develop a comprehensive plan in order to identify objectives, goals, budgets and strategies that will be consistent with the maximization of share values and satisfying customers. The purpose of this report is to fulfill the internship requirement. The reason behind an internship is to gather practical knowledge about the corporate world and apply the theoretical knowledge on practical field which one has gathered through out his educational life. The major objective of the report is to present an overview of Prime Bank Limited and to know about its management system, functional and financial aspects. Deposit is often called the lifeblood of commercial banks. No commercial bank can be thought of without deposit. In fact modern commercial banking starts with deposits from the public followed by lending or financial trade, commerce and industry. The most of the deposit of a bank come from the various type of bank account that is provided by a bank. This is a Savings Scheme in which a person gets the opportunity to build up savings by contributing monthly installments and receives an attractive fixed amount at the end of a specified term. The Scheme is designed to help the fixed income group to save money and build up a sizable fund with which they can go for some income generating venture to improve the quality of their life and/or meet any future financial obligations. Minimum size of monthly installment shall be Tk. 500/- and multiplies of Tk. 1000/-. Maximum installment size shall be Tk. 25,000/- The Deposit shall be for a period of 5 years. This is a Deposit Scheme where the depositor gets monthly benefit out of his deposit. The scheme is designed for the benefit of the persons who intend to meet the monthly budget of their families from the income out of their deposit. Investment of fund of Trusts and Foundations, which award monthly scholarships/ stipends to students, etc. Deposit of Tk. 25,000.00 (Taka twenty five thousand) and multiples thereof, but maximum Tk. 25, 00,000/- (Taka twenty-five lac) shall be acceptable under the Scheme. The Deposit shall be for a period of 5 (Five) years. The Principal amount is refundable on maturity. The educational expenses particularly the expenses for higher education are sharply increasing day by day in our country. Prime Bank Limited has introduced a Savings Scheme entitled “Education Savings Scheme” in accordance with the principles of Islamic Sariah i.e., on the basis of profit and loss sharing. Deposit of Tk. 50,000/- and multiples thereof but maximum limit of Tk. 5, 00,000/- at a time will be acceptable under the Scheme. The instrument shall be issued for a period of 5 years term. On maturity a lump sum amount of Tk. 85,382/- shall be payable or education allowance @ Tk. 1,854/- per month per Tk. 50,000/- shall be payable on the basis of deposit amount for next 5 years starting from the completion of the term as per following table. Income Tax @10% on interest may be deducted at source at the time of payment of lump sum amount. Fixed deposit scheme should be kept for a fixed term or period. Prime Bank Limited deals with the following terms deposit. A short-term deposit (STD) account is a running account with amounts being paid into and drawn out of the account continuously. These accounts are called Demand Deposits or Demand Liabilities since the banker is under obligation to pay the money in such deposits on demand. These accounts are generally opened by Business Organization, Public Institution, Corporate Bodies. A STD account may be opened by an individual person. It is an interest bearing deposit. Interest is calculated on daily basis as per Banks Prescribed Rate and is credited to account on half yearly basis. In a Lakhopati Deposit Scheme depositor will have to pay monthly installment into a bank and after completing maturity he or she will get certain amount of money. The depositor will have the option to choose any installment size and period at the time of opening of the account and will not be allowed to change the size of installment afterwards. Account in the name of minors can be opened too under the Scheme as per standard procedure for minor accounts. A person can open more than one account for any size of installment in any branch of the Bank. In case of death of a depositor, the account will cease to be operative and the amount deposited so far shall be paid to the nominee, and in absence of nominee, to the legal heirs of deceased as per rules in force. The Scheme shall be implemented through all the branches of Prime Bank Limited. Deposit of Tk. 25,000/- (Taka twenty five thousand) and multiplies thereof but maximum limit of Tk. 25,00,000/- (Taka twenty-five Lac) at a time will be acceptable under the scheme. A specially designed Receipt shall be issued for the deposit under the Scheme in the same manner as issued in case of FDR. Branches shall use the existing SDS receipts for issue of instruments under this scheme till separate receipts are supplied. The instrument shall be issued for 06 (six) years term. At maturity after 06 (six) years’ double the amount of deposit will be paid to the depositor. The persons having confirmed/permanent job in any one of the following organizations and age between 20 to 50 years are eligible for availing of Credit facilities under the Scheme. Besides the above, Professionals like Doctors, Engineers, Architects, Lawyers, Journalists, Chartered Accountants; Self Employed Business Executives are also eligible for enjoying credit facilities under this scheme subject to the providing of Bank Guarantee or Insurance Guarantee for the amount of Credit. All activities are conducted according to Islamic Shariah. Building partnership relation between the Bank and its customers. Following Islamic principles in its investment portfolio. While investing special consideration to social needs are given. Through small and long term deposit schemes providing hope to the poor income group of the society. Client service centric banking, through which making the clients feel special. By the cheque a customer can withdrawal his money from his account. Usually anew cheque book is issued after the confirmation of the customer’s address but if the customer has a loan account with the credit division then he can get that before address confirmation. The front desk of the bank deals with the procedure of issue of cheque book. Customer will fill up the cheque requisition slip by writing down the account number, name of the account holder, address and signature of the account holder and present to the passing officer. After that the officer prepares the cheque book with the account number and branch seal. The issued cheque book posted in the proper cheque book issue register and will receive the sign of the customer after handing over the cheque book to him. A pay order is a written order, issued by a bank, to pay a certain sum of money to a specified person or a bank. It may be said to be a banker cheque as a bank drawn upon and payable issues it by itself. A pay order is issued and paid by the same branch of a bank and such, the drawer and the drawee are the same. The person or the organization in whose favor it is issued is known as payee or the Beneficiary It is sometimes sold to the individual on payment of value to may or may not be a customer and is called the purchaser. The purchaser should sign the standard application form giving detailed particulars and request for issue of pay order. The payee or beneficiary must not appear to be fictitious. His full name and address should be written on the application. Bank should recover commission of pay order from the purchaser. A pay slip is written authorization for making payment-specified person or firm payable by issuing branch, for a discharge liability of the bank. As pay slip is originated made payable by the bank in a receipt form there is no need for any application for its issue. A pay slip is issued to effect payments on account of bills payable for goods and services purchased or availed by it. For example, bank is required to make payment of bills for the purchase of furniture & fixture, for printing & stationary and for any other works done on its behalf by the other party on agreement with the bank. Demand drafts: Demand draft is a written order to pay money, drawn by one branch of a bank for a sum of money payable to order on demand. A draft cannot be done payable to bearer. Customers may purchases draft or non-customers of the bank. The purchaser of the draft must fill in the relative application form with his name, amount, and name of the payee, the amount and the office in which it is drawn. In order to sure safety, the purchaser is advised to cross the draft and the bank gives a test number. Having issued the draft the issuing officer would send the drawee branch, an advice containing the particulars of the draft. Mail Transfer: Mail transfer is an advice regarding remittance of funds sends by one branch of the bank to another branch of the same bank, at the written request of the application. The mail transfer contains the name and address of the remitter. It is a nonnegotiable instrument and generally is not handed over to the customer rather sent through post office to the concerned branch for credit to the respective account. In some cases, full address of the beneficiary required to be maintained by the applicant. Such MT is an advance and treated as a credit voucher of the paying branch, no separate advice is issued by the issuing branch. On receipt of the MT payment is made by debit to issuing branch through SB account. Telegraphic Transfer: Telegraphic transfer may be affected at the written request of any person and against value received from him. A written application on the bank’s prescribed form duly signed by the purchaser should be obtained. If the application for issue of telegraphic transfer contains instruction to debit the account of the purchaser, his or her signature should be verified. It is however, preferable to obtain a confirmation cheque from the customer. Debit the customer account by the amount of the cheque. Credit the account of the ordering branch by the amount of the cheque. Main copy and responding copy of IBCA are sent to the responding branch and HO copy is sent to Head Office of Prime Bank Limited through courier or messenger. Make payment of the cheque after proper presentation of it. Debit the amount of the branch which cheque has bee presented by the written amount. Prepare four IBCA comprising main copy, responding copy, HO copy and originating copy with the IBDA no, responding branch name and code. A/C name and number and amount of the cheque. Main copy and responding copy of the IBDA are sent to the responding branch and HO copy is sent to Head Office of Prime Bank Limited through Courier or messenger. In banking practice of Prime Bank Limited, outward bills mean cheque or other instrument written on the branch which is not in the same city where the bill is presented. On the other hand, local bill means the cheque or other instrument which drawn and presented in two different branches but are located in the same city. In short outward bill and local bill are called OBC and LBC. The customer will receive money from the branch where instrument is presented but may not be in the same date. It depends on when the cheque is sending for collection and the distance between the two branches. Receiving the instrument again from the branch after collection. Issuing IBDA comprising main copy, responding copy, HO copy and Originating branch of the IBDA. IBDA will be signed by two P.A. holder of the originating branch of the IBDA. Then the IBDA will be posted in the computer by debiting the branch on which instrument was written and crediting the customer account. Main copy and responding copy of IBDA are sent to the responding branch and HO copy is sent to Head Office of Prime Bank Limited. attendance. On the other hand a person can open a current a/c signally, jointly or in the name of an organization, club, association, or institution can open current account providing Bye-Law and articles of association acceptable to the bank. Account opening form to be filled in and signed by each of the applicant with largest passport size photograph (2 copies) for each applicant attested by the introducer, copy of passport/any identity card, introduction of the applicant to be signed by introducer with account number, one copy of the nominee’s photograph and signature of the nominee. Minor accounts additional requirements are copy of the birth certificate and photograph. Verify officer of the branch will verify the introducer signature by checking it up with the signature provided by signature verification software. After verification of the introducer’s signature, accounts opening officer will give the customer the current a/c or savings a/c no which he intended to open and will posted it to the account opening register. Then the customer will deposit the initial deposit (Tk.2000 for SB a/c and Tk.5000 for current account) in the account number provided by the opening officer. Then a/c opening officer and signature verification officer will sign on the form. Then the form will be approved by the HOB and Operation Manager. The officer at the computer then post the a/c opening form with any special instruction and credit the customer’s account by the initial amount. After that the compliance officer of the branch will check the a/c opening form whether all the instruction of Bangladesh Bank is followed up to open the account. FDR (fixed Deposit Receipt) is another popular scheme of Prime bank Limited. Here a depositor will deposit fixed amount at the FDR. He will get the principal and interest amount at the maturity of the FDR. The customer will fill up the FDR account opening form with a passport size photograph, nominee’s photograph, mailing address, permanent address, period and special instruction. The account opening officer will provide a FDR no. on the form, posted it on the register and at the computer. The customer will deposit the FDR amount in the accounts. Properly completed form will be signed by HOB and Operation Manager. After these steps the officer will write down a receipt and hand over it to the customer. Then the compliance officer will check the a/c opening form and regularize it. In this part the matured accounts or the accounts which are unwilling to continue the by the customer is encased. When there is a mature encashment, the customer will get the principal amount deposited and interest on the deposited principal amount at the rate which is prescribe in the particular account opening form. The income tax on interest amount is deducted from the maturity amount. In the case of pre mature encashment the officer has follow some terms and conditioned. The account holder will get less than he should get at the maturity date if he does pre-mature encashment. Locker Service: Bank provides safe custody of the customer’s valuable assets in exchange for the locker rent. Opening B/O Account: Some specific branches of Prime Bank also offer the customer to open B/O account. Bank Statement: Bank statement is the summary of transaction with the bank for specified period of time. Prime bank charges TK.200 for every statement and Tk.10 per month for deposit scheme. Solvency Certificate: Bank also provides the solvency certificate to their customer in permission of the Head office. Bank charge Tk.200 for each solvency certificate. period of time . SWOT Analysis is a strategic planning method used to evaluate the Strengths, Weaknesses, Opportunities, and Threats involved in a project or in a business venture. It involves specifying the objective of the business venture or project and identifying the internal and external factors that are favorable and unfavorable to achieving that objective. The technique is credited to Albert Humphrey . A powerful strategy supported by good corporate governance to increase shareholders value by being efficient, professional transparent and accountable to society and environment. PBL has strong brand image as it has won the prestigious ICAB award for being the best bank in Bangladesh and “A” graded bank according to the CAMEL rating. Products and services are as diversified as the market segment demands and the customer group range from individuals, big corporate clients, NGOs to Non residents. PBL has strong capital position. The asset and liability committee (ALCO) of the bank maintains a satisfactory trade-off between liquidity and profitability. The bank is able to achieve higher growth of loans and deposit than the industry rate. Prime bank limited has strong balance sheet with favorable ROE and ROA. Low non-performing assets or classified loans of the bank signify strengths in credit customer selection. The bank has covered all the global locations of homebound remittance. The bank has now a network of 65 branches throughout the country. The quality of asset is one of the strong areas of operation of PBL. Many of the branches of PBL are under CBS T24. This is helping to minimize the errors. PBL has well diversified asset portfolio to retail, SME and capital market. PBL has a good credit rating of AA which is rated by Credit Rating And Information Services Limited (CRISL). All of the branches of PBL are still not under the CBS T24.this lacking is creating operating inefficiency such as human error, fraud and forgeries. The junior level management of PBL is not as efficient as the mid and top level management. This may be because of the lack pf proper training to the junior and training officer. risk management of lending portfolio often require stress testing which are based on sophisticated mathematics tools and cannot solely be dependent on existing MIS. The level of technology in banking industry is yet acquiring that sophistication. the employees of the branches which are under T24 are facing some sort of problem to cope up with the new software that is why it is taking more time to serve a customer. The ATM booths owned by the PBL are not sufficient in comparison to the other banks. PBL has lack of manpower to serve the growing customer demand. PBL took a strategic shift towards developing and expanding the SME financing which has received considerable attention of policy makers. Implementation of world class CBS T24 in number of branches will reduce fraud and forgeries and other operating risks arising from human error. this bank has establish remittance arrangement with 24 leading exchange companies and banks including the global money transfer agency Western Union in 2007. The bank introduced direct selling service recruiting highly trained and customer focused professionals. Finance Act of 2007-08 has withdrawn the withholding tax on purchases by credit card and it is expected that credit card business will again have fast growth in 2008. Changes in general economic condition resulting from calamities and political disturbance. The bank is now facing increasing interest sensitive customer who are demanding higher rate of return. Reducing the margin ratio for investment accounts. Introduction of compliance issues raised by the international forums which is likely to affect the export growth. The rising price of oil and other importable items have exerted pressure on dollar which has squeezed the exchange and fee earning of the bank. To compete with the new and lucrative offerings by the other banks are great threats for the bank. Account opening procedure: Customers of Prime Bank Limited gets different type of services or facilities from the bank. Sometime they become satisfied or sometime they become dissatisfied with performance of the bank. From the survey I find out that in terms of account opening procedure almost 8% of the customer said that they find that the procedure is excellent, 26% said that the account opening procedure is very good, 30% of the respondent said that the account opening procedure is good, 30% of respondent said that the account opening process is satisfactory and 6% told that they are dissatisfied with the account opening procedure. Interest Rate: None of the customer has said that the interest rate is excellent, 10% told that the interest is very good, 24% of the customer said that the interest rate is good, 36% of the respondents said that they are satisfied with interest rate and 30% of the respondents said that they are dissatisfied with the interest rate. Yearly Charge: None of the customer thinks that the yearly charge is excellent, 10% think that the yearly charge is very good, 44% of the respondents said that the yearly charge is good, 32% of the respondent are satisfied with the yearly charge and14% said that they are not satisfied with the yearly charge. Employees Behavior: From the graph we can see that 8% of the respondents think that the behavior of the employees are excellent, 28% of the respondents said that the behavior of the employees are very good, 40% of the respondents think that behavior of the employees are good, 20% of the respondents responded for satisfactory and only 4% respondents said that they were not satisfied with the behavior of the employees. So that we can say that most of the customers are satisfied with the behavior of the employees. Complexity while Dealing with Big Transaction : From the above chart we see that 16% of the respondents strongly agreed that they have faced process complexity while dealing with big transaction, 10% of the respondents agreed that they have faced process complexity while dealing with big transaction, 38% of them were neutral about this statement, 30% of the respondents disagreed about the statement that they have faced process complexity while dealing with big transaction and 6% of the respondent strongly disagreed that they have faced process complexity while dealing with big transaction. Branch Location: From the above chart we can see that 36% of the respondents think that the location of the Ring-Road (Shamoly) Prime Bank is excellent, 50% of them choose the bank because they think the location of the branch is very good, 10% of the respondents think that the location of the branch is good, 4% of the respondent choose the branch because they think the location is satisfactory and none of the respondent are dissatisfied with the location. Security: In light of the above chart we can say that none of the respondent think that the security of the branch is excellent, 34% of the respondent think that the security system of the branch is very good, 40% of the respondents think that the security is good, 26% of the respondent go for the option satisfactory and none of them think that the branch is unsecured. Always Provide Better Customer Service: We can see that 6% of the respondents strongly agree that the bank always provides better service, 32% of the respondents agree with the statement that bank always provide better service, 30% of the respondents are neutral, 26% of the respondents are disagreed with the statement, and 6% of them strongly believe that the does always provide better service. In light of the above chart we see that 10% of the respondents strongly agreed with the statement that the bank always provides diversified products, 14% of the respondents agreed that the bank always provides diversified products, 24% of them were neutral about this statement, 32% of the respondents disagreed about the statement that bank always provides diversified products, 20% of the respondent strongly disagreed that the provides diversified products . From the above chart we see that 30% of the respondents strongly agreed with the statement that they are satisfied with the queue service, 34% of the respondents agreed that they are satisfied queue service, 18% of them were neutral about this statement, 14% of the respondents disagreed about the statement that they are satisfied with the queue service and 4% of the respondent strongly disagreed that they are satisfied with the queue service. From the above chart we see that 6% of the respondents strongly agreed that they are satisfied with the ATM facility of the bank, 10% of the respondents agreed that they are satisfied with the ATM facility of the bank, 12% of them were neutral about this statement, 28% of the respondents disagreed about the statement that they are satisfied with the ATM facility of the bank and 44% of the respondent strongly disagreed that they are satisfied with the ATM facility of the bank. Process Complexity while Dealing with Big Transaction. During the survey and informal interviews with the customers I came to know that the introducer for Savings and Current Account is one of the major problems to them. Though now PBL has started online banking but all of its branches are not online. On the other hand the signature of the customers of other branches most of the times are not scanned so that if any customer of other branch of PBL introduces the applicant then it is impossible to verify the signature. To solve this problem the online branches should update their account holders’ signature regularly and the process of on-line conversion of the banks must be faster. Prime Bank Limited, Ring-Road branch should provide quick service of deposit and withdrawal of cash for their valuable customers. As the customers need not wait for long time so more cash counting machine and sufficient manpower should be provided in this area. PBL should increase its interest rate of some of its products by this it can attract more customers willing to open their accounts in the bank. Ring-Road Branch of Prime Bank Limited should more concern about customer service. It should provide more trained manpower to support the customer and help them to solve their enquiries. While doing my internship in Ring-Road Prime Bank, I have noticed that there are shortages of manpower only eleven officers are employed in Ring-Road branch . It has huge number of customers but to deal with these customers the manpower is not sufficient. So that there must be right number of employees in the right place and the PBL should provide behavioral training to the employees to deal with the customers more efficiently and more smartly. Now a day evening banking is well-known and warmly acceptable services from the perspective of the customer. In today’s busy world everybody is busy with his or her activities in the whole day. It is difficult for them to find out a few times to go to the bank. So if the bank especially Ring-Road branch establish their evening banking services then it will be beneficial for the customer. If any one wants to withdraw a big amount of money he needs to inform the branch 7 days earlier. So if any one needs instant money he/she can not withdraw money at that time. So the branch needs to increase its fund capacity. Few days ago Ring-Road Branch has started its ATM facility. It should provide ATM debit Cards to its valued customers faster so that the satisfaction level of the customers accelerated. On the other hand PBL should increase its number of ATM booth to make convenient use for its customers. Customer opinion is very important for the development of a service oriented organization. So if the branch consider the customers opinion then it will be helpful to the Bank also. They can place a customer opinion box where the customer can write down their opinion and drop that to the box. By this the banks can get important information from their client and the customers also think that they are valuable to the bank. While doing my internship in Ring-Road Prime Bank, I have noticed that in Ring-Road Branch of PBL there is shortage of Locker. No new customer can occupy a locker in this branch so that the customers who live close to the branch have to face difficulty to go for another branch. If this branch can increase its locker facility then it will be helpful to for the customers.